Whether in ultra-quick roller-skating procession by foot-scooter- speeding-rocket-racing-technology or a seven-mile-robot-footed-machine – the absurd animal characters in Ann Cathrin Raab’s “Word Scuttle-Scramble-Race” tell readers abouta competition in which the participants all have their own ideas of how they can win. Join the chase in which small figures whizz by and find out who is making whose life a misery, who has the fastest vehicle, and who reaches the finish line first. 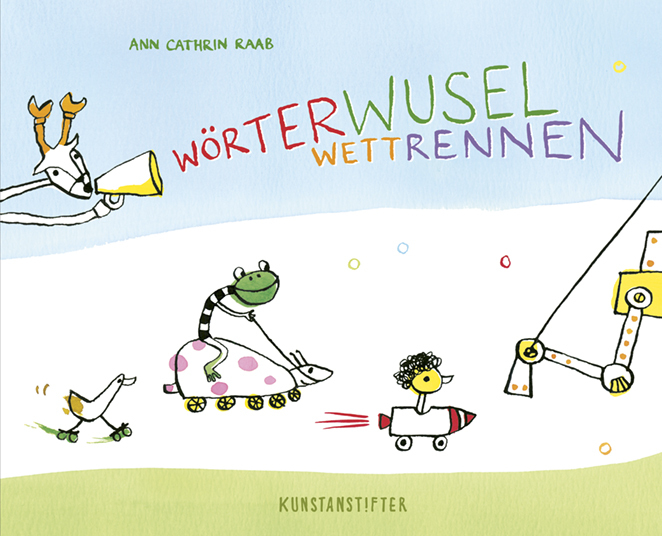 This sequel to Raab’s first book “Wörterwuselwelten/Into a World of Words”, which was published in 2016 by kunstanstifter. This new book offers readers a chance to venture off on an expedition with more of her remarkable illustrations and stories chockful of adventure.